Clean Criminal Record for the applicant and his/her spouse and depended children age 16 and above from the country of their residence. The applicant should not have any frozen assets in EU in result of sanctions taken against him/her. An applicant (including family members if applicable) whose application for citizenship in any other member-state of the EU had been rejected, is not eligible to apply for the acquisition of the Cypriot citizenship through the Cypriot Investment Programme. Schengen Visa: The applicant and his dependents must be holders of a valid Schengen Visa. Third-Country nationals that do not require an entry visa for travelling in European Union member-states, as well as citizens of European Union Member States are excluded from this obligation. Residence Permit in Cyprus:The applicant and all adult members of his/her family must hold a residence permit in Cyprus for at least 6 (six) months before applying for Citizenship. The six-months period commences on the issuance date of the residence permit (card). In case the applicant and his/her dependents are not holders of a residence permit, they may apply for an immigration permit based on the Regulation 6 (2) of the Aliens and Immigration Law, at the same time with the submission of the application for Citizenship. In case the application for Citizenship is rejected, the immigration permit, obtained in accordance with the provisions of this Decision, will be cancelled immediately. Residence in the Republic of Cyprus with purchasing price not less than 500.000 EUR (+VAT) should be acquired by the applicant and should be kept for a Lifetime. In case the purchase property is of higher value, the additional amount can be considered as a supplement to the total amount of investment. All dependents of the applicant, included under his/her application are covered. Members of the same family, who apply separately as investors, can collectively acquire a residence, provided that the total value of this home-property covers the amount of €500.000 per each applicant. In case that the applicant has invested in housing unit/units on the basis of the criterion 2, the purchase of another permanent residence in Cyprus will not be required, provided that the purchasing price of one of these housing units is at least €500,000, plus VAT. 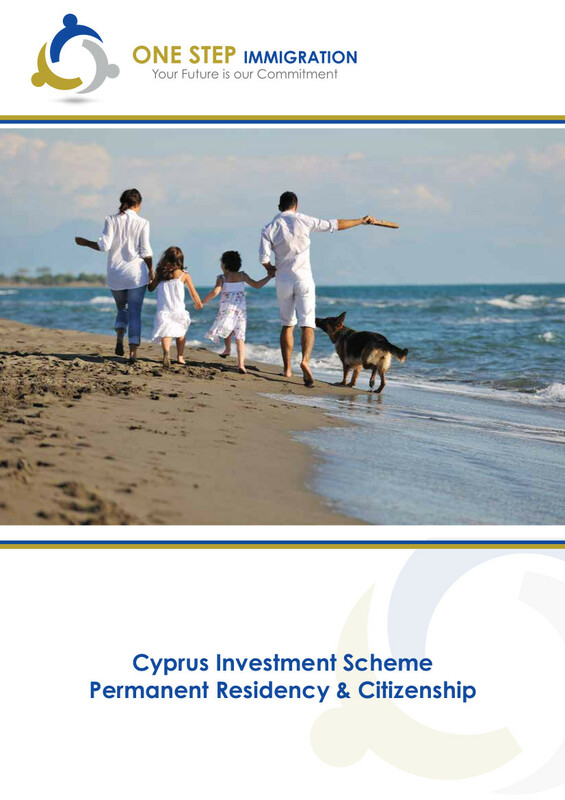 However, if the applicant has invested in housing units that have already being used for the purpose of acquiring the Cypriot citizenship via the Programme, the above provision will be in force provided that the total amount of the investments, including the privately-owned residence, is at least €2,5 million. Not required during the process, or after that. Letter by the applicant or by the representative of the applicant, in which the investment and criterion under which the application is submitted, are briefly explained. “Self-Declaration by the Applicant who has received services for the purposes of the Cyprus Investment Programme” duly completed and signed by the investor. “Self-Declaration by the Service Provider for the purposes of the Cyprus Investment Programme” duly completed and signed by the representative of the applicant. Clean Criminal Record From country of Origin and Residence (if different) not older than 90 days from the date of submission. Due Diligence Report issued through an internationally accepted database (e.g World Check, LexisNexis Diligence, Regulatory DataCorp Inc. etc) not older than 30 days from the date of submission. Declaration by the applicant concerning any citizenship applications he/she may have submitted in any other EU signed before Registrar of a Cypriot Court or a consular officer. Copy of the wire transfer of the donation to the Research and Innovation Foundation to an account in a Cypriot commercial banking institution in the name of the Foundation. Copy of the wire transfer of the donation to the Cyprus Land Development Corporation to an account in a Cypriot commercial banking institution in the name of the Corporation. Investment Agreement in Cypriot company or companies. Proof of payment of the agreed amount. Copy of the wire transfer to a Cypriot Bank in the name of the seller or the seller’s company. An evaluation certificate from an independent registered land surveyor (if required by the Ministries). Investment Agreement in Cyprus company or companies. Copy of the wire transfer to a Cypriot Bank in the name of the company or the organization. Copies of the employment contracts of the Cypriot or EU citizens employed by the company. Confirmation from the Social Insurance Department as to the insurable income of the Cypriot or EU employees in the company. Copy of the Social Insurance Contributions for every Cypriot or EU citizen employee. Any other document that might be requested by the Ministry of Interior, or the Ministry of Finance. IMPORTANT NOTE: All documents issued by foreign authorities should be translated into either Greek or English and be duly authenticated by APOSTILLE, or they should be sealed by the Ministry of Foreign Affairs of the issuing country and the diplomatic mission of the Republic of Cyprus in the issuing country).